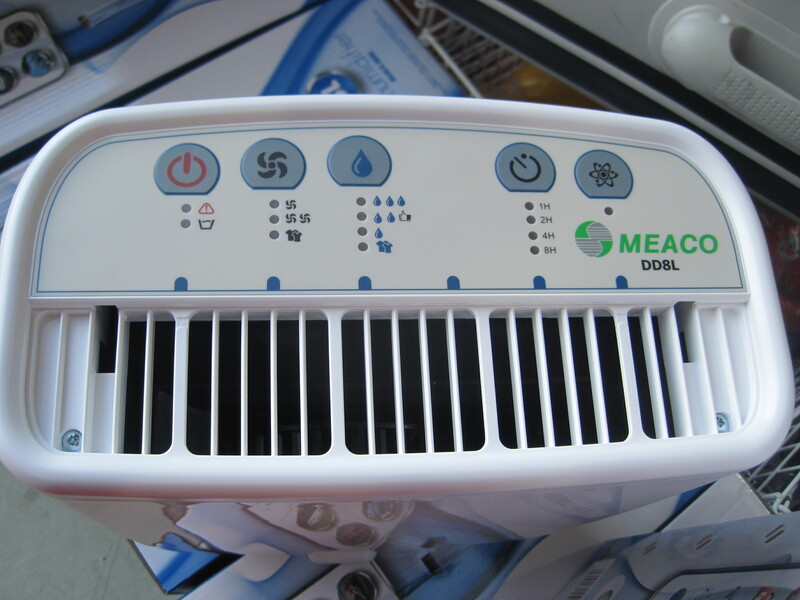 The EcoAir DD122MK5 and the Meaco DD8L dehumidifiers are very similar dehumidifiers and you may be wondering what the differences are between the two models. First of all you should be aware that both of these dehumidifiers are desiccant dehumidifiers. Desiccant dehumidifiers are ideally suited to operation in the British Isles as not only can they run at lower temperatures than compressor dehumidifiers but they are cheaper to run at lower temperatures as well. Both the EcoAir DD122 MK5 and the Meaco DD8L dehumidifiers are excellent indoor domestic type dehumidifiers as both feature anti-bacterial filters and ionisers. The anti-bacterial filters kill bacteria upon contact and the ionisers pull down airborne dust, dirt and pollen particles which either fall into the filter or onto the floor where they can be hoovered up. if you are looking for an outdoor application, where the anti-bacterial filters and ionisers don’t matter, then I would suggest looking at the EcoAir Eco DD122FW or the Meaco DD8L Junior dehumidifiers. Both dehumidifiers feature overdry protection. This means that when using Laundry Mode or another high setting fror long periods of time the air may become too dry and uncomfortable. The dehumidifiers stop this problem by ceasing to function when the relative humidity falls too low (around 40%RH). A comfortable RH level for a house would be around 50%. Both the EcoAir DD122MK5 and Meaco DD8L feature a soft touch control panel that is very easy to operate. The control panel of both dehumidifiers feature a timer with 2/4 and 8 hour options, a fault indicator which notifies the operator when the machine is overheating (in case of prolonged use in Laundry Mode for example) etc and an indicator which lights up when the water tank is full. The first stated difference is the extraction rate. The EcoAir DD122MK5 extracts at a rate of 7 litres per day whilst the Meaco DD8L extracts at 8 litres per day. The test environment for the EcoAir DD122MK5 was a little lower than that of the Meaco DD8L (20C/60%RH against 30C/80%RH) so actual daily extraction rates should be around the same for both machines. Your personal extraction rate will be due to the moisture of the area as well as the size of the area. Both water tanks hold 2 litres of gray water and feature a lid for ease of carrying the full container to the sink. The water tank of the EcoAir DD122MK5 pulls out at the side whilst the water tank of the Meaco DD8L is situated at the rear of the dehumidifier. Both dehumidifiers also feature a water level indicator lower down on the machines so that the operator can easily monitor the dehumidifiers water level. Continuous drainage is available for both models although the hose comes supplied for the Meaco DD8L but not for the EcoAir DD122MK5. The EcoAir DD122MK5 operates at 34dB at its lowest setting compared to 39dB for the Meaco DD8L . This difference is very small and probably won’t be noticed unless using the dehumidifier in the bedroom when you are trying to sleep. The EcoAir DD122MK5 has a power consumption of between 300-580W compared to the Meaco DD8L which uses 330-650W. Each dehumidifier will probably consume around 30W when in fan only mode. The weight for each dehumidifier is very similar with the EcoAir DD122MK5 weighing 6kg and the Meaco DD8L weighing 6.4kg. At this weight castor wheels are not an issue. Note however that the Meaco DD8L has a very convenient carry handle at the top rear whilst the EcoAir DD122MK5 has carrying handles lower down forcing you to bend over more. Of particular note is that the EcoAir DD122MK5 contains a 3D Louvre which can be used to push the air to a wide area or to a particular spot. The louvre is very handy for a particularly stubborn mould spot or for drying laundry indoors. The louvre features a swing mode which means that the louvre can move to direct air into the area you want. The Meaco DD8L by contrast has a grille next to its control panel. Whilst this grille lets out warm air, which is up to 10C-12C warmer than surrounding air temperature, it is not as effective as having a louvre. Both dehumidifiers have auto control so that when a set RH level is reached the dehumidifier goes to rest until the set RH level is breached. Once this occurs the dehumidifier will come back to life and work to get the RH down again. As you can see the EcoAir DD122MK5 and Meaco DD8L differences are small. The two main differences are the fan settings. I personally prefer the larger range of settings of the Meaco although honestly I will only aim for 40% RH, or below, when drying laundry. The MK5 has a 3D louvre which is an excellent feature for pushing warm air across the room or for pinpointing a particular area for quick drying (such as paint and laundry etc). One minor feature that both dehumidifiers lack is a digital reading of the current relative humidity level. Instead the fan settings are designated by water droplets with one droplet being the lowest setting and three droplets being the highest setting with a picture of a T-shirt denoting Laundry mode. As a final note I must confess that I own a Meaco DD8L and would recommend it highly. However I am sure that purchasers of both the EcoAir DD122MK5 and the Meaco DD8L will be very happy with their decision.